About 5,000 armoured vehicles 1947-90. Japan emerged from world war two as from a cataclysm, in a devastated and occupied country. Mac Arthur’s decision to keep Emperor Hirohito in place helped the country keep a link to its past, culture, and honour, while at the same the International Military Tribunal for the Far East judged war the criminals that do not commit Seppuku after the surrender. Prime minister Shigeru Yoshida accepted military bases on Japanese soil, now a strategic asset, facing USSR, while retaining a neutral position on foreign affairs, and with a primary objective of economic growth. It was argued that the success of radical changes in Japan was helped by the desperate situation at home, a situation that reflected the German rebirth, under new democratic principles. In 1947, a de facto alliance with the USA saw a new constitution signed on May 3, 1947, a diet with universal suffrage elected members was established, and the Treaty of Peace with Japan was signed internationally in September 1951, ratified by the congress next year, and by the Japanese diet in 1953. Full sovereignty was recognised on April 28, 1952. Left and right wing political parties were formed in 1955, but the LDP (Liberal Democratic Party) remain in the majority during the 1950s and 1960s, placing economic growth as the number one priority. Until the 1980s, Japan will enjoy a post-war economic miracle. Rearming Japan, like Germany, was a logical step in the communism containment doctrine defined in the USA. In the context of the Korean war, Japan became the number one supplier of US and allied forces in the area, while retaining a neutral position. But rearming, although encouraged by the USA was not an easy step to take. General public opinion sentiments were strongly oriented towards pacifism, while the constitution of 1947 itself stated (art.9) that Japan “forever renounces war as an instrument for settling international disputes and declares that Japan will never again maintain land, sea, or air forces or other war potential”. Along the peace treaty, the Mutual Security Assistance Pact between Japan and the U.S. ratified in 1952, the latter was responsible for the defence of the archipelago, in land, sea and air. That allow Japan to maintain only a National Police Reserve (expanded to 110,000 men), the National Safety Forces, and a coast guard force equipped with ex-US navy ships, destroyers and destroyer escorts. US supplies with Japan however decreased after the Korean war, and at the same time the soviet threat concerns pushed the new government to extend the defensive forced in 1954 split between the three traditional arms, land, air and sea. in 1960, revision of the Japan-United States Mutual Security Assistance Pact was contested and US military presence decreased to the only occupation on Okinawa, which ended in 1972 at the end of the Vietnam war. 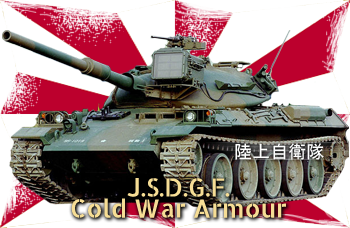 The Japanese Self Defence Ground Forces (陸上自衛隊; Rikujō Jieitai) was founded in July 1954. Its main original goal were to maintain internal security in Japan and counter a possible Soviet invasion of Hokkaido. JSDGF General Headquarters are based in Ichigaya, Tokyo. It is a small, but professional, well trained and well-equipped army of 148 000 men (now 170 000). NCOs came from four universities and were formed at the National Defence Academy at Yokosuka and a youth cadet program is instituted. Due to the nature of the landscape and urban density, training grounds are few in numbers, but counted in command post exercises, map manoeuvres, simulation, and overseas training at the Yakima Training Center in the United States. The JSDGF was until now divided into five military regions subdivided into fourteen districts, the Northern Army, headquartered in Sapporo, Hokkaido, the North Eastern Army, headquartered in Sendai, Miyagi, the Eastern Army, headquartered in Nerima, Tokyo, the Central Army, headquartered in Itami, Hyōgo, and the Western Army, headquartered at Kumamoto, Kumamoto. Reserves are divided into the rapid-reaction component and the main reserve. The first has a 30-days yearly training, while the second had five days of training a year. As of 2007 these counted respectively 8,425 and 22,404 men. Japanese M41A3 Walker Bulldog. 141 were operated in the 1960s, up to the 1990s. Just one example of some of the US tanks provided to the Japanese after the Second World War. The Type 61 was the first tankdesigned and built by the Japanese military after the Second World War. The Tank entered service in 1961 as was armed with a 90mm Cannon. They Type 74 was designed to replace the Type 61. It was armed with a license-built copy of the NATO standard 105mm L7 main gun. It was the first of Japan’s main battle tanks to incorporate hydropneumatic suspension that allowed the tank to tilt forwards, backwards, and side-to-side. The tank was designed in 1975 but didn’t enter service until 1980, by which time it was quite obsolete. The Type 87 Self-Propelled Anti-Aircraft Gun (SPAAG) was greatly inspired by the German Flakpanzer Gepard. It even features the same 35mm Oerlikon cannons. The vehicle was based on the hull of Type 74 MBT, and retained the hydropneumatic suspension. The SPAAG entered service in 1987. 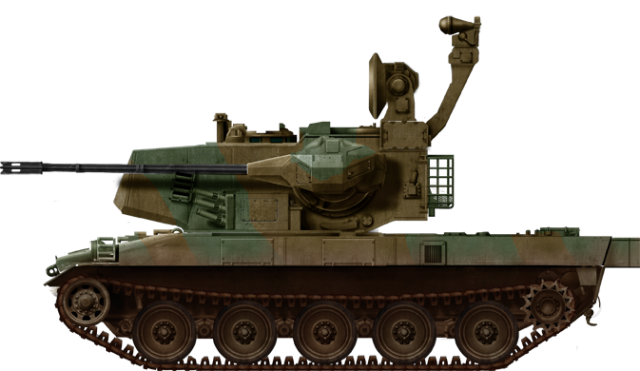 The Type 60 was one of post-war Japan’s first tracked Armored Personel Carriers (APCs). A number of its components were shared with the Type 61 Tank, and there was even an Anti-Tank Guided Missile (ATGM) carrying variant. The Type 73 is today’s the main Japanese tracked APC. Developed as a replacement for the Type 60 it had an aluminium hull and a mid-engined layout. Production stopped after the 338th vehicle in 2012, with a possible extra production if needed. Komatsu’s Type 82 wheeled Command & Communication vehicle (1982), production stopped recently, after 231 vehicles. 155 mm self-propelled howitzer M110A2, built under licence in the 1960s by Japan Steel Works and Komatsu (91 in service). 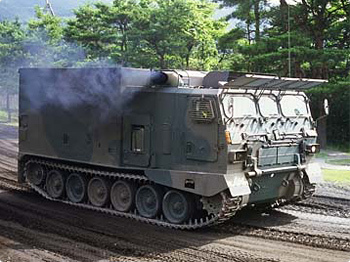 IHI Aerospace licence-built version of the M270 self-propelled multiple rocket launcher (99 built).